So I'm asked to explain a "Writ of Mandamus." For those of you who had a misspent youth and didn't learn your Latin, mandamus means "we command" in that ancient language. The "we" refers to judges of superior jurisdiction who take charge of a situation where an obvious injustice has occurred. A writ of mandamus is a commandment to make things right. 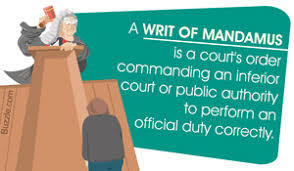 Mandamus, for example, is used to restore rights to a complainant who's been denied them, and writs of mandamus have traditionally been issued in response to abuses of judicial process. If Nathan Miller isn't a walking abuse of judicial process, then we don't actually know a hawk from a handsaw. So the petition filed in Raleigh on Friday by plaintiffs Sam Furgiuele, Marshall Ashcraft, and Connie Ulmer requests an order from the Superior Court directing Kim Strach, Executive Director of the NC State Board of Elections, to notify the Watauga County Board of Elections that the election is over, that the plaintiffs won and should be certified as the winners, and that furthermore the Nathan Miller election protest is dead for failing to meet its deadline for appeal. Leave it to Kim Strach to allow ugly wounds to fester. If only she'd do her job willingly.